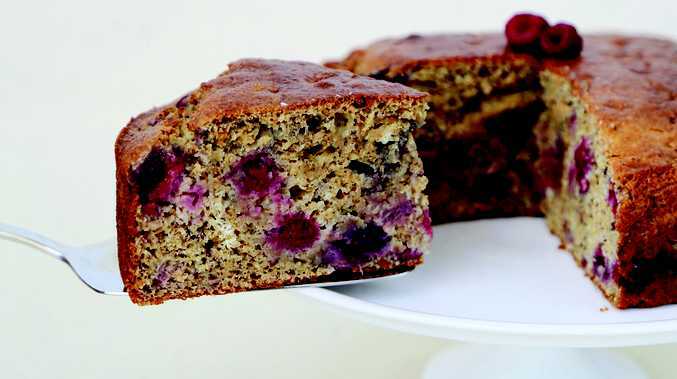 FROM Symply Too Good To Be True book seven comes this delicious banana, bran and raspberry cake recipe. Step 1: In a large mixing bowl beat egg whites and sugar for 1 minute using an electric beater. Add bicarb soda to banana, then add to bowl and combine using a wooden spoon. Step 2: Pour milk into melted margarine then add to bowl with bran and combine. Step 3: Sift flour into mix in one go, gently fold ingredients together. DO NOT BEAT as this will make the cake tough. The less the mixture is moved, the lighter the cake. Step 4: Gently fold in raspberries then pour into a round cake tin (19cm) that has been coated with cooking spray. Bake 45-50 minutes or until firm to touch in the centre. Check centre with skewer or toothpick to know if cooked through. Leave in tin for 5 minutes then turn onto a wire rack. Dust lightly with icing sugar. Variation: Replace raspberries with any frozen berries of your choice, or instead of a cake, make into 12 muffins. 180ºC for 20-25 minutes or until cooked to touch in centre. Dietitian's Tip: There is no need to avoid bananas. They are a great source of vitamins, potassium and other minerals. Recent studies have confirmed that they have a low GI, even when they are served ripe.